Originally created by Mattel to replace their ageing G.I.Joe line in 1999, Max Steel action figures and toys have sold by the millions ever since. With constant refreshes of the ranges to coincide with a new film or TV series of the same name, they all feature Maxwell McGrath, the 16 year old student with supernatural powers. A collection of different enemies like Toxzon, Jason Naught or Miles Dredd challenge the superior powers of the invincible Max Steel. All of these characters have made it into the Mattel toy ranges. Vehicles like the Turbo Motorbike Playset bring Max to life as kids can recreate their favourite scenes from the series. Spinning Turbo Battlers featuring different Max Steel characters can have epic battles where the losers fly off their revolving bases! Masks, disc blasters, walkie talkies and turbo swords have all been given the full character treatment, as well as jigsaws and games highlighting Max’s amazing powers. 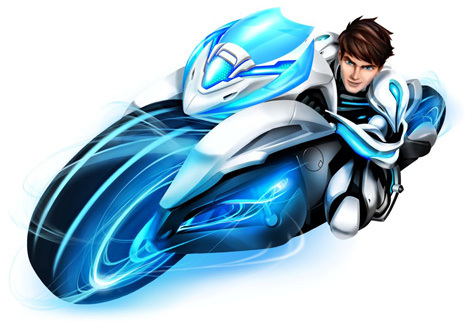 A live action Max Steel film is set to spawn a whole new range of action figures and vehicles. Mattel are promising toys featuring awesome details and working features. Well known actress Maria Bello plays character Molly McGrath, Max Steel's single mother.